This entry was posted in Kropotkin Cryptic Crossword Solutions and tagged answer, crossword, cryptic, kropotkin, solution on December 17, 2016 by pavlov.a. I think it is about time you gave an honest comment regarding the lack of solutions to the kropotkin and listener crosswords. 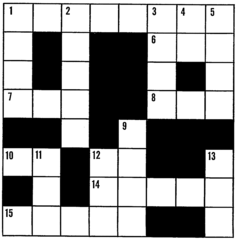 It surely cannot be more difficult to publish the answers than to compile the actual crossword. It is a service that is being missed as sometimes a solution to a clue can lead to a successful completion of the total puzzle. If the compiler is unavailable why can’t someone step in until he is. Hi Kay Sara, thanks for your comment. The solutions on this site are posted as a public service – Pavlova is just another person who enjoys solving cryptic crosswords and has no connection with the compilers. So the answers cannot be made available until a crossword has been published and Pavlova has had a chance to complete it. This is normally with 12-24 hours, although often it’s much quicker than this. Since the Kropotkin 969 crossword won’t be published until the morning of 24 Dec 2016 (ie next week), Pavlova’s solution won’t be available until later that day. The reason that there are pages with the message ‘Sorry, this solution is not yet available’ is because when we post a new solution, we also create an empty page for next week’s solution. That’s to make sure that search engines have a few days to index it. Otherwise it wouldn’t be searchable through Google (say) for a few days after it was posted. As long as you are aware of the number of the crossword you want a solution for, this shouldn’t cause a problem. Perhaps you are looking for the solution to Kropotkin 968? Strictly speaking, the clue for 6 Down is a little misleading as there is now no such entity as Manukau City!